According to the Organisation for Economic Co-operation and Development (OECD), the total amount of Official Development Assistance (ODA) provided by OECD members was of $146.6 billion in 2017, 0.6% less than in 2016. According to the figures published by the organisation, this decrease can be explained by a reduced spending on refugees in donor countries that - this may come as a surprise to some of our readers - is considered as part of development assistance (around $14 billion in 2017, roughly 10% of total assistance provided). The organisation also stresses that bilateral assistance to “less advanced countries” (meaning poorest countries), after years of decrease, grew by 4% to reach $26 billion. Total aid to Africa as a whole increased by 3% to reach $29 billion (of which $25 billion for sub-Saharan Africa). 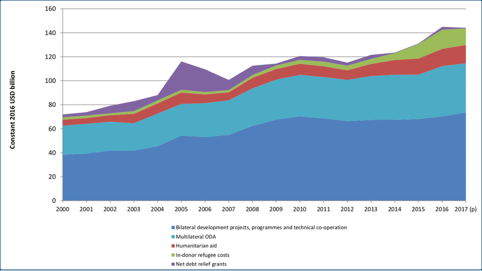 Simultaneously, humanitarian assistance grew by 6.1% in real terms and was equal to $15.5 billion. But amount of aid is only one side of the aid coin: quality also matters. In this context, it is important not to forget that an increasing share of official development assistance is used to help rich countries’ companies’ activities in poor and emerging countries. Moreover, aid is generally considered as being rather inefficient in promoting a real development, despite all the experience accumulated since the ’60s which should have allowed, with the required good will, to define the most effective way of promoting development. It is worth to place in context all these figures. ODA provided by rich OECD countries is only “equivalent to just 0.31% of their combined gross national income (GNI), down from 0.32% in 2016 and well below a United Nations target to keep ODA at or above 0.7% of donor GNI.” The “good performers” are Sweden, Luxembourg and Norway (around 1% of their GNI), while the “bad performers” are Hungary, the Czech Republic and Slovakia (around 0.1% of their GNI). France “gives” 0.43% of its GNI, the US 0.18%, Germany 0.66% and the UK 0.70%. In volume, the US is the biggest donor ($35 billion), followed by Germany ($25 billion of which more than 20% are for refugees in Germany) and the UK ($18 billion), France with $11 billion ranking fifth just after Japan. Regarding agricultural development assistance, it represents around 4% of total ODA, while food assistance weighed around 1% in 2016 (OECD). These figures do not account for ODA provided by countries not member of the OECD. Aid from these countries cannot be neglected: it amounts to around $20 billion dollars per year, according to OECD estimates, the main donors being, by order of importance, Saudi Arabia, United Arab Emirates and Turkey. In addition, ODA provided by China has been estimated to be, on average every year between 2000 and 2014, around $20 billion. Another way to replace these figures in context is to compare ODA with some economic indicators for beneficiary countries. In the case of Africa, the $29 billion of ODA should be compared with its GDP (almost $8,000 billion in 2017) and with the annual negative balance of $41 billion of the financial flows to and from Africa, as estimated by a coalition of UK and African equality and development campaigners [read]. Rich countries’ governments say they are worried by rapid demographic growth in Africa and by the huge population migrations that can be expected to result from it later in the century. But it is not by making speeches, building fences or walls that this threat can be dealt with. What is needed here is a radical redefinition of the rules on which our economic system is based and that generate unequal exchange and poverty in the South. Also required is massive investments to the benefit of the local population in Africa and elsewhere in poor countries (not to the benefit of shareholders of companies based in rich countries! ), so as to create sufficient opportunities for local people not to be tempted to embark on the dangerous trip leading towards the illusion of a rich countries’ Eldorado. It is clear from the figures we just examined, that we are a long way off what is required. •OECD, Development aid stable in 2017 with more sent to poorest countries OCDE, 2018. •Plundering Africa (Season 2), 2017. •Terrorism, Hunger, Migrations : Why are we unable to address the root causes of our problems? 2016. •Bringing people out of poverty by connecting them to the global economy: USAID’s Global Development Lab, 2014. •Le «Blending»: formule magique pour mobiliser plus de ressources pour le développement ou subvention à l’endettement ? 2013 (in French). •Insufficient support to agricultural development, 2013.